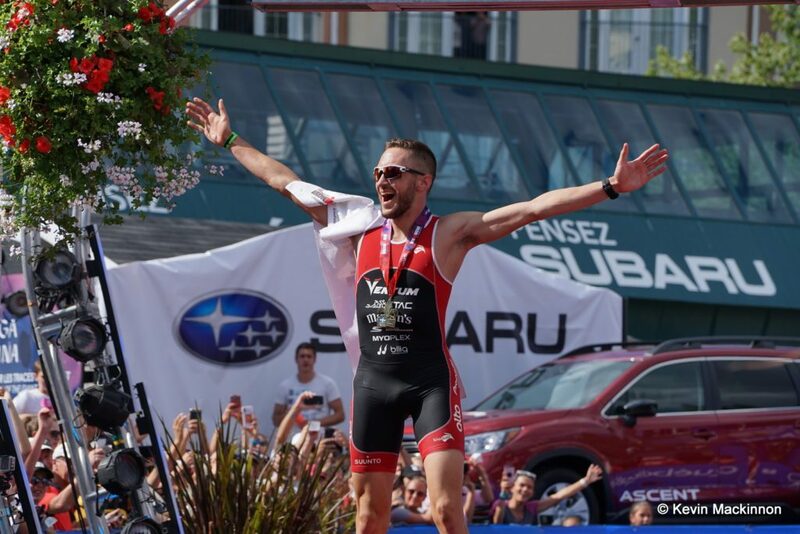 Cody Beals wins Ironman Mont-Tremblant. Then at Ironman Chattanooga, Beals followed up his debut win with another one, seven weeks after his big win in Quebec. On that day, the swim was cancelled due to high currents, Beals completed the 187-km bike and 42.2-km run in 7:10:22, taking the title and earning a spot on the start line in Kona in October. Two Ironman races. Two Ironman wins. In Mont-Tremblant, he beat Sanders, the 2017 Kona runner-up and Matt Russell. In Chattanooga, he beat Russell again. A few weeks after that race, Russell would finish sixth in Kona. 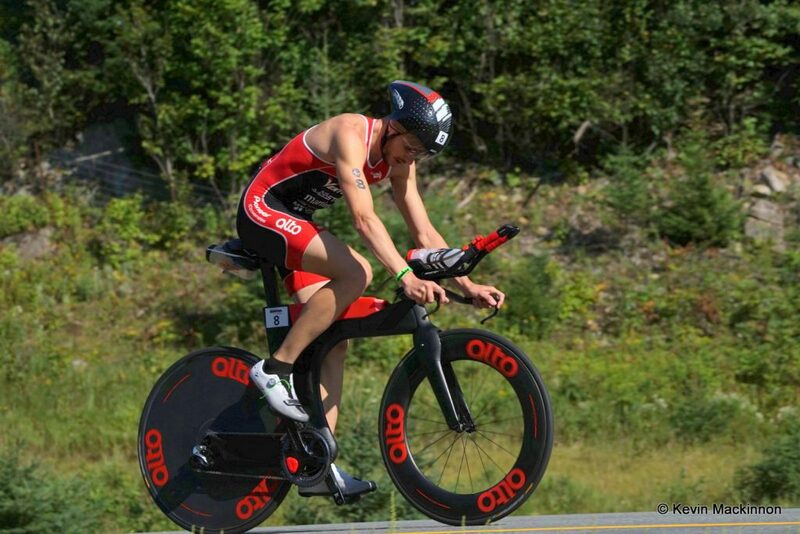 Cody Beals on the bike course at Ironman Mont-Tremblant. Here at Triathlon Magazine Canada, we’re not the only ones who have recognized just how promising Beals’ Ironman career might be. Now that he’s got his Kona start nailed down, he was able to accept an invite from the folks at Challenge Roth next year. On his website, Beals describes himself as a “nerd in jock’s clothing.” He gets to say that because he graduated at the top of his Queen’s University physics class in 2012. Chatting with the guy, though, you’d never use the “nerd” moniker. He’s well-spoken, easy-going and infinitely approachable – not unlike Sanders, who he’s raced against for years as the two rose up through the professional ranks. Beals competed as both a runner and triathlete in high school and at university. After graduating from Queens, he worked as an environmental science consultant while “applying an analytical, data-driven approach to training and racing” and steadily rose through the age group ranks. In 2013 he took the Ontario Long Distance Championships, breaking the four- hour barrier, and a year later he turned pro. Almost immediately he was making podiums at various 70.3 races across North America. In 2018, the year began with a win at Ironman 70.3 Taiwan. After disappointing results in Texas and Mexico, Beals started to get on a roll. At 70.3 Victoria, he set a new course record and took then win. He took the Eagleman title for the third time. And then he got down to work preparing for his first Ironman. Beals has achieved all these professional top finishes under the careful guidance of David Tilbury-Davis. Since he moved to Guelph in 2017, he’s done a lot of swimming with Craig Taylor’s Guelph Triathlon Project. He averages less than 20 hours a week of training, considerably less than many Ironman pros who routinely rack up well over 30 hours a week of training. Much of that work, though, is at a fairly high intensity. The bottom line is that it works. Cody Beals surged onto the world scene in 2018 and earned our Triathlete of the Year honours. We’re getting used to seeing Joanna Brown dominate the elite side of the sport and in 2018 she excelled once again. It was a self-admitted “up and down” season for the 26-year-old from Carp, Ont., but one which included a bronze medal at the Commonwealth Games and another top-five World Triathlon Series finish when she took fourth in Montreal. Things got off to a crazy start for Brown when she crashed at the first WTS race of the season in Abu Dhabi and fractured her shoulder. Brown is hardly new to adversity, though. A few years ago she was ready to call it a career after a string of injuries, but she hung on and enjoyed a breakthrough year in 2017, earning TMC’s triathlete of the year honours in the process. With a month to go before the Commonwealth Games, she buckled down and somehow managed to rehab the shoulder to the point where she could compete. All of which made that bronze medal in Australia, which was Canada’s first medal of the Games, even more satisfying. Brown used the day’s fastest 5-km effort to nail down the final spot on the podium and become only the fourth Canadian to earn a medal at the Commonwealths. Unfortunately, Brown endured more bad luck through many more of the WTS series races, including getting caught behind a crash in Hamburg. There was the highlight in Montreal, but then the bad luck returned for the Grand Final. “The season has been extremely difficult and very frustrating,” Brown said after a flat tire derailed her day at Australia’s Gold Coast. Some impressive results in the Super League Series saw her end up seventh in the standings with one more championship event to go early in 2019, too. Which is even more evidence of just how up and down Joanna Brown’s 2018 ended up. It’s a good sign, though, when even a year like that net’s you a triathlete of the year award.